The passenger compartment remained stable in the frontal impact. 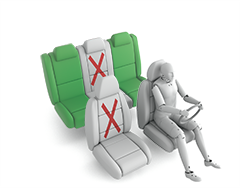 Dummy readings indicated good protection of the knees and femurs of the driver and the passenger. Lexus showed that the same level of protection would be provided to occupants of different statures and to those sat in different positions, whose knees may contact the dashboard in a different place. The NX scored maximum points in the side impact barrier test, with good protection of all critical body areas. In the first side pole impact test, the frontal impact airbags deployed in a later phase of the test, after the side loading on the dummy was finished. Lexus investigated the cause of this airbag deployment and found that the airbag control module, which houses an acceleration sensor, could experience a significant fore/aft signal even in a side impact. The algorithms controlling the airbag deployment were changed to safely prevent deployment under such loading and a repeat test was allowed. In that test, protection of the chest was marginal and that of the abdomen was adequate, while that of the head and pelvis was good. Lexus do not believe that the airbag deployment in a later phase of the impact is a safety issue and have no plans to modify earlier cars. Accordingly, the star rating applies from VIN JTJBJRBZ**2009745 and is not valid for earlier cars. 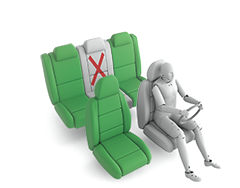 Tests on the front seats and head restraints, and a geometric assessment of the rear restraints, indicated good protection against whiplash injuries in the event of a rear-end collision. Lexus's 'Pre-Crash Safety System' is an autonomous braking system that operates from low, city-type speeds to higher speeds typical of inter-urban driving. As the system is not standard, its functionality at low speeds did not qualify for assessement. In the frontal impact, chest accelerations of the 1½ year dummy were marginally high, despite the use of a rearward-facing restraint. Forward movement of the head of the 3 year dummy, sat in a forward-facing restraint, was not excessive although forces in the chest and neck were marginally high. In the side impact, both dummies were properly contained within the protective shells of their restraints, minimising the risk of dangerous head contact with the vehicle interior. The front passenger airbag can be disabled to allow a rearward-facing child restraint to be used in that seating position. Clear information is provided to the driver regarding the status of the airbag and the system was rewarded. All of the restraint types for which the car is designed could be properly installed and accommodated in the car. The bumper showed good or adequate protection to pedestrians' legs. However, the front edge of the bonnet scored no points, providing poor protection to the pelvis region. Tests results on the bonnet surface were predominantly good or adequate with poor results recorded only at the base of the windscreen and on the stiff windscreen pillars. 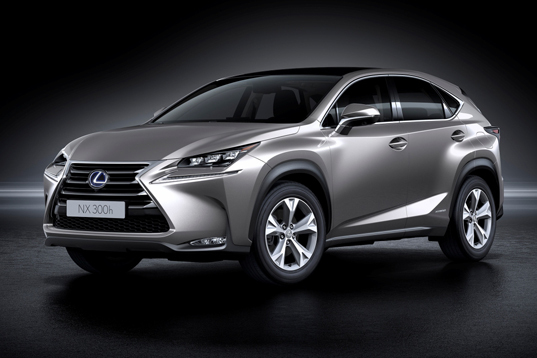 The NX has electronic stability control as standard equipment, together with a seatbelt reminder for the front and rear seats. A speed assistance system uses digital mapping to determine the relevant speed limit and this information is presented to the driver. The driver can then set the speed limiter to the appropriate speed. The system is an option that is expected to be fitted to most cars sold so it was included in the assessment and met Euro NCAP's requirements for systems of this type. A lane departure warning system is an option that is not expected to be fitted widely enough to qualify for assessment by Euro NCAP. However, the 'Pre-Crash Safety System', Lexus's autonomous emergency braking system, is expected to be on most cars sold so it was tested and demonstrated good performance.